Computer Audio Design unveils £480 USB cable | What Hi-Fi? 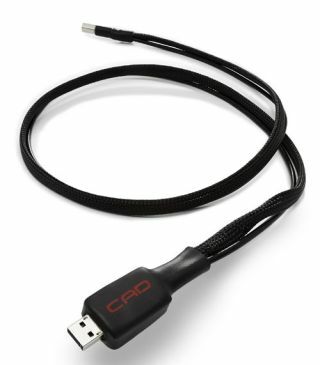 The new CAD USB cable uses patent-pending proprietary technology and comes with a 30 day money-back guarantee. It's designed to get the most out of USB-equipped music. Bristish audio manufacturer, Computer Audio Design, has unveiled a new USB cable which aims to "maximise sound quality from USB-equipped music playback systems". The CAD Cable has been designed in house by Scott Berry - the man responsible for the 1543 DAC - and is hand-made in London. It's designed to eradicate high-frequency noise found in all computer audio sources, while propietary technology used in the design of the cable produces a low-noise interconnect. CAD is reluctant to reveal too much information of the technologies used, but it has said it uses a highly shielded independent cable for the power line, thus reducing the impact of high-frequency noise from the computer's USB interface. The CAD Cable is available now in a standard length of 1.1m for £480. If for any reason you're unhappy with the cable, CAD is offering a 30-day money-back guarantee. Other lengths are available to order too.